Is Hydroponics right for me? Great question to ask, especially when you want to dip your toes into Hydroponics. If you want to see the whole picture of Hydroponic gardening - the benefits and its downsides, you'll love this post. I'll be totally upfront to let you learn thoroughly about Hydroponics. By the time you finish the post, you can make the decision whether to start with this method or not. You may click the button to jump to the section you want to learn. In a sense, you can grow crops in places where the land is limited, doesn't exist, or is heavily contaminated. In the 1940s, Hydroponics was successfully used to supply fresh vegetables for troops in Wake Island, a refueling stop for Pan American airlines. This is a distant arable area in the Pacific Ocean. Also, Hydroponics has been considered as the farming of the future to grow foods for astronauts in the space (where there is no soil) by NASA. Because all that plants need are provided and maintained in a system, you can grow in your small apartment, or the spare bedrooms as long as you have some spaces. Plants' roots usually expand and spread out in search of foods, and oxygen in the soil. This is not the case in Hydroponics, where the roots are sunk in a tank full of oxygenated nutrient solution and directly contact with vital minerals. This means you can grow your plants much closer, and consequently huge space savings. Like in greenhouses, hydroponic growers can have total control over the climate - temperature, humidity, light intensification, the composition of the air. In this sense, you can grow foods all year round regardless of the season. Farmers can produce foods at the appropriate time to maximize their business profits. Plants grown hydroponically can use only 10% of water compared to field-grown ones. In this method, water is recirculated. Plants will take up the necessary water, while run-off ones will be captured and return to the system. Water loss only occurs in two forms - evaporation and leaks from the system (but an efficient hydroponic setup will minimize or don't have any leaks). It is estimated that agriculture uses up to 80% water of the ground and surface water in the US. While water will become a critical issue in the future when food production is predicted to increase by 70% according to the FAQ, Hydroponics is considered a viable solution to large-scale food production. In Hydroponics, you have a 100% control of the nutrients (foods) that plants need. Before planting, growers can check what plants require and the specific amounts of nutrients needed at particular stages and mix them with water accordingly. Nutrients are conserved in the tank, so there are no losses or changes of nutrients like they are in the soil. All of the minerals are contained in the water. That means you can measure and adjust the pH levels of your water mixture much more easily compared to the soils. That ensures the optimal nutrients uptake for plants. Is hydroponically plants grown faster than in soil? Yes, it is. You are your own boss that commands the whole environment for your plants' growth - temperature, lights, moisture, and especially nutrients. Plants are placed in ideal conditions, while nutrients are provided at the sufficient amounts, and come into direct contacts with the root systems. Thereby, plants no longer waste valuable energy searching for diluted nutrients in the soil. Instead, they shift all of their focus on growing and producing fruits. If you have grown in the soil, you will understand how irritating weeds cause to your garden. It's one of the most time-consuming tasks for gardeners - till, plow, hoe, and so on. Weeds are mostly associated with the soil. So eliminate soils, and all bothers of weeds are gone. And like weeds, getting rids of soils helps make your plants less vulnerable to soil-borne pests like birds, gophers, groundhogs; and diseases like Fusarium, Pythium, and Rhizoctonia species.Also when growing indoors in a closed system, the gardeners can easily take controls of most surrounding variables. Since you are using no soils and while the weeds, pests, and plant diseases are heavily reduced, there are fewer chemicals used. This helps you grow cleaner and healthier foods. The cut of insecticide and herbicides is a strong point of Hydroponics when the criteria for modern life and food safety are more and more placed on top. Besides spending fewer works on tilling, watering, cultivating, and fumigating weeds and pests, you enjoy much time saved because plants' growth is proven to be higher in Hydroponics. When agriculture is planned to be more technology-based, Hydroponics has a room in it. This interest will put you back in touch with nature. Tired after a long working day and commute, you return to your small apartment corner, it's time to lay back everything and play with your hydroponic garden. Reasons like lack of spaces are no longer right. You can start fresh, tasty vegetables, or vital herbs in your small closets, and enjoy the relaxing time with your little green spaces. 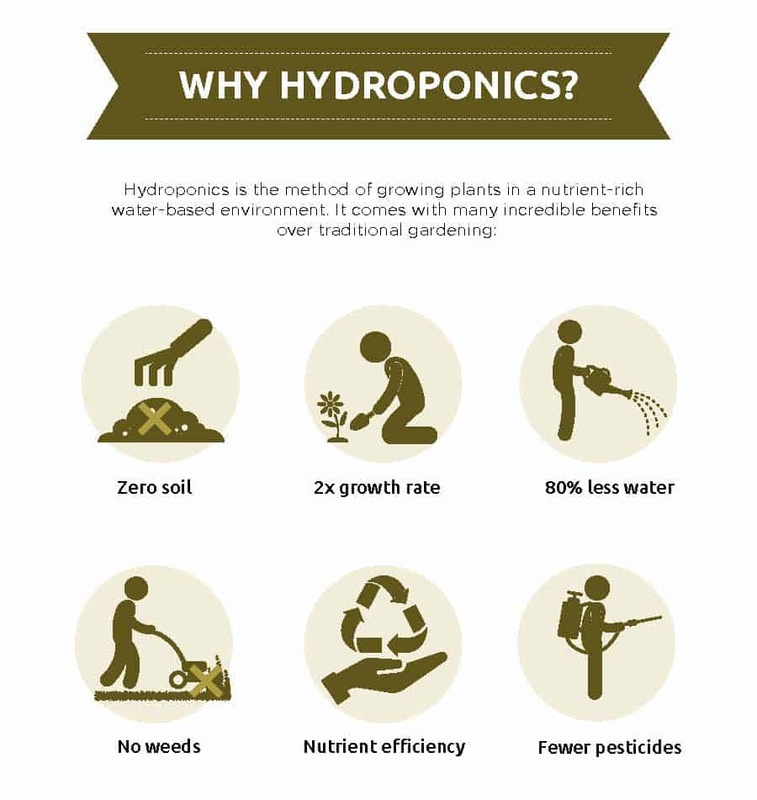 Seem like there are lots of benefits of Hydroponics and the image below seems to try to persuade you into Hydroponic growing. But keep reading to learn about its downsides. Just like any things worthwhile in life, hard-working and responsible attitude gives satisfactory yields. However, In soil-borne counterparts, plants can be left on its own for days and weeks, and they still survive in a short time. Mother nature and soils will help regulate if something is not balancing. That's not the case in Hydroponics. Plants will die out more quickly without proper care and adequate knowledge. Remember that your plants are depending on you for their survival. You must take good care of your plants, and the system upon initial installation. Then you can automate the whole thing later, but you still need to gauge and prevent the unexpected issues of the operations, and do frequent maintenance. You are running a system of many types of equipment, which requires necessary specific expertise for the devices used, what plants you can grow and how they can survive and thrive in a soilless environment. Mistakes in setting up the systems and plants' growth ability in this soilless environment and you end up ruining your whole progress. There have been some heated arguments about whether Hydroponics should be certified as organic or not. People are questioning whether plants grown hydroponically will get microbiomes as they are in the soil. But people around the world have grown hydroponic plants - lettuces, tomatoes, strawberries, etc. for tens of years, especially in Australia, Tokyo, Netherland, and the United States. They have provided food for millions of people. You cannot expect perfection from anything in life. Even for soil growing, there are still more risks of pesticides, pests, etc. compared to Hydroponics. There are some organic growing methods suggested for Hydroponic growers. For example, some growers provide microbiomes for plants by using organic growing media such as coco coir and add worm casting into it. Natural-made nutrients are commonly used such as fishes, bones, alfalfas, cottonseeds, neems, etc. For this debate for the organic product issue, there will still be researches done currently and in the near future. And we'll know the answer then. In a Hydroponic system, mostly you use water and electricity. Beware of electricity in a combination of water in close proximity. Always put safety first when working with the water systems and electric equipment, especially in commercial greenhouses. You are using electricity to manage the whole system. So suppose you do not take preliminary actions for a power outage, the system will stop working immediately, and plants may dry out quickly and will die in several hours. Hence, a backup power source and plan should always be planned, especially for great scale systems. You are sure to spend under one hundred to a few hundreds of dollars (depending on your garden scale) to purchase equipment for your first installation. Whatever systems you build, you will need containers, lights, a pump, a timer, growing media, nutrients). Once the system has been in place, the cost will be reduced to only nutrients and electricity (to keep the water system running, and lightning). If you follow news on agriculture start-up, you may have known that there have been some new indoor hydroponic business started recently. That's a good thing for the agriculture sector and the development of Hydroponics as well. However, commercial growers still face some big challenges when starting with Hydroponics on a large scale. This is largely because of the high initial expenses and the long, uncertain ROI (return on investment). It's not easy to detail a clear profitable plan to urge for investment while there are also many other attractive high-tech fields out there that seem fairly promising for funding. You are growing plants in a closed system using water. In the case of plant infections or pests, they can escalate fast to plants on the same nutrient reservoir. In most cases, diseases and pests are not so much of problem in a small system of home growers. So don't care much about these issues if you are beginners. It's only complicated for big hydroponic greenhouses. So better to have a good disease management plan beforehand. For example, use just clean disease-free water sources and growing materials; checking the systems periodically, etc. Should the diseases happen, you need to sterilize the infected water, nutrient, and the whole system fast. So would I still recommend Hydroponics? There are downsides to Hydroponics, just like any other things in life. But you can overcome most of them with just some planning and experiences. Considering the pros it can offer, Hydroponics is worth doing. Meanwhile, Hydroponics has great potential. The market for Hydroponics is expected to expand dramatically in the coming years. It is valued at USD 23.94 billion (2018) and is forecast to account for a CAGR of 6.8% from 2019 - 2024 (source). So if you are already interested in Hydroponics, go create one now. You'll enjoy it. If you don't, I hope that this article has given you some light about Hydroponics. And whether you like it or not, we have to admit that Hydroponics is always a part of modern agriculture and can be the farming of the future with proven competitive points over soils - Space saver; effective use of plant nutrients; ưater-efficiency; no weeds, fewer pests, and plant diseases; stable and higher yields; control of the whole system; fewer fertilizers and insecticides used; easy to transplant; able to grow crops all year round, etc. If you want to start with the method of soilless growing, let's go into more details about it with the following articles. Very detailed. I'm just starting with Hydroponics, and this gives me very useful knowledge about it. I would definitely recommend hydroponics!!!! Can we use this method for cultivating false fruit( cashew nuts fruit). I haven't tried growing hydroponic cashews. But I think you can. However, since cashew is a large fruit plant, it is harder to grow and needs more care in Hydroponics. Could you tell me the authors first and last name? It was written by me - Max Payne. Thanks. I frequently check and update the article so that the information is always up-to-date. Thanks for the amazing information about hydroponics. I'm sure it'll help a lot for my investigatory project. Thank you very much; u gave very detail information. now i can take care of its drawbacks. Can you please share whether hydroponic farming can help in growing crops like wheat, rice, grams, potato, onion, etc or just limited to plant based farming only ? Thank you so much for a detailed & commendable new farming technics.